This book is the result of a challenge given at a Sonlife Ministries training event. The Challenge: Go to scripture and figure out the character traits of a follower of Jesus Christ. More than a decade later (closer to two actually!) my thinking has been refined through more than forty talks, the red pencils of a diverse group of peer reviewers, as well as my ruthless editor Joanne. It is not the end of the project but is a significant milestone. 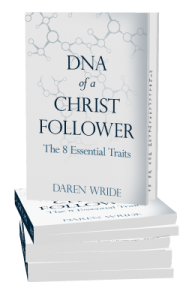 This book seeks to answer, from scripture itself, what it means to be a follower of Jesus Christ, at the core. What are the key character traits, the things we are called to be, from which will flow all we are called to do? To purchase a copy for yourself or get a deal on a 10-pack for your small group, check out My Store. How to Sell…an Enema Kit?